Cover painting (one of four) for the short story anthology by Cory Doctorow, With a Little Help. 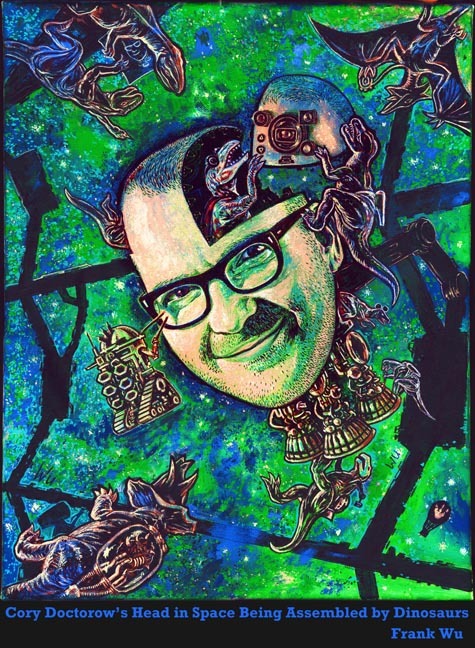 This painting has references and homages to a number of different works by Cory, including "I, Robot" and "Someone Comes to Town, Someone Leaves Town", "Overclocked," "Little Brother," "Down and Out in the Magic Kingdom," plus Cory's appearances in XKCD, etc. Can you find them all?